Former U.S. 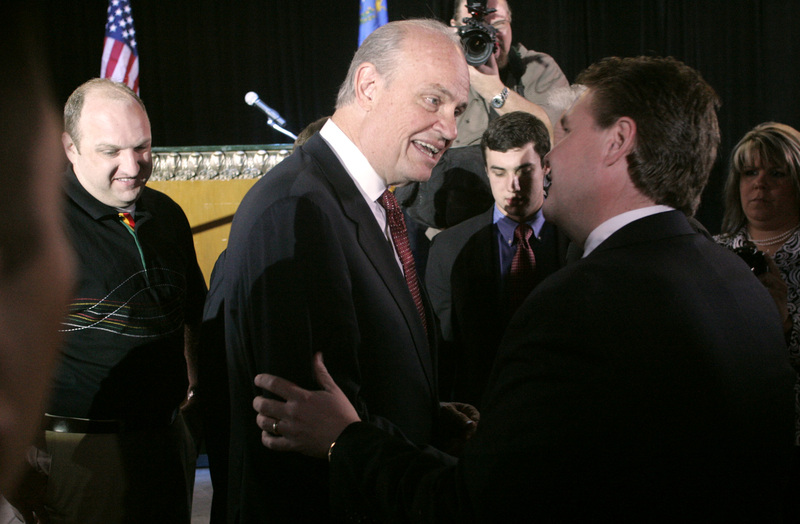 Senator Fred Thompson talks with supporters after a fund raiser at Stoney’s Rockin Country bar in Las Vegas on Nov. 1, 2007. Thompson's Credentials: Entering late into the GOP presidential race, Fred Thompson brings Hollywood celebrity status and possibly an answer to Republicans seeking a candidate who can appeal to the GOP's conservative base and to moderates and independents. More voters may know Thompson from his more recent TV and film roles than from his political career. But Thompson first emerged in the national political spotlight in the 1970s during the televised Watergate hearings, when he served as minority counsel to the Senate Watergate Committee. Thompson has been a private practice attorney, worked as special counsel for several congressional committees and has also been a lobbyist. In 1994 he won a special election for the U.S. Senate seat from Tennessee that was vacated when Al Gore became Vice President. Thompson held that seat until retiring from office in 2003. As a senator, Thompson chaired the Senate Committee on Governmental Affairs from 1997 to 2001, when Democrats took control and he became ranking minority member. He led the investigation into allegations that China was trying to influence the outcome of the 1996 presidential and congressional elections. However, that investigation was stymied when witnesses either refused to cooperate, plead the 5th Amendment or fled the country. Since leaving the Senate, Thompson's activities have included: being on the advisory board for the I. Lewis "Scooter" Libby Jr. defense fund; helping steer the White House effort to get John Roberts' appointment to the Supreme Court confirmed by the Senate, and being an ABC radio political commentator, substituting for Paul Harvey. Thompson made his acting debut playing himself as a lawyer in the 1985 film, "Marie." The film was based on a book about a 1977 corruption case involving Tennessee's former Gov. Ray Blanchard. Blanchard had fired a parole board chairman, Marie Ragghianti, who refused to release prisoners who had bribed Blanchard's aides for clemency. Thompson, then in private law practice, represented Ragghianti in a lawsuit, which she won. The 6-foot-5 Thompson had a strong screen presence in the film and received other acting roles as a result. He has since played on-screen or voice roles in 18 films, including "Die Hard II" and "The Hunt for Red October." Since 2002, he has played the role of conservative New York City District Attorney Arthur Branch in the NBC TV drama, "Law & Order" and its spinoffs. Thompson formed a presidential exploratory committee early in 2007 and officially announced he would run for president on Sept. 5, 2007, on "The Tonight Show." Although Thompson carries the conservative banner and says he is pro-life on the abortion issue, he has been criticized for being a paid lobbyist for a short time for a family planning group with a pro-choice agenda. Place of Birth: Sheffield, Ala. Experience: U.S. Senate from Tennessee, 1994-2003 (won special Senate election, Nov. 8, 1994); Appellate Court Nominating Committee, Tennessee, 1985-1987; Special Counsel to the U.S. Senate Intelligence Committee, 1982; Special Counsel to the U.S. Senate Foreign Relations Committee, 1980-1981; Special Counsel to Tennessee Governor Lamar Alexander, 1980; Chief Republican Counsel (Minority Counsel), U.S. Senate Watergate Committee, 1973-1974; Assistant U.S. Attorney, Middle Tennessee, 1969-1972; campaign manager for U.S. Sen. Howard Baker; staff attorney for Baker. Notables: Thompson began his dual career as politician and actor in 1985 after playing himself in film adaptation of "Marie." Once romantically linked to country singer, Lorrie Morgan in 1995, Thompson married his second wife, Jeri Kehn in June of 2002; she is 24 years his senior. In 2002, his daughter with first wife died of accidental prescription drug over dose. Thompson on the Issues: A look at where Thompson stands on the issues and how he has voted. Nevada Contributions: A breakdown of Thompson's financial contributions from the Silver State. State by State Contributions: A breakdown of Thompson's financial contributions across the U.S.
Thompson's MySpace page: Read Thompson's profile information and leave a message. Thompson's Facebook page: View a Thompson supporter's page and leave a message. Thompson's Flickr page: View Thompson's latest photos from the campaign trail. YouTube Videos: View Thompson's latest political videos. Thompson's Blog: See Thompson's official campaign blog. Thompson's e-mail is currently down. Campaign Manager: Bill Lacy and more key people.